What a strange but wonderful evening for Temple Chapter 1094, a triple event crammed into one memorable and fun filled moment. The chapter, which meets at the Liverpool Masonic Hall, welcomed the demonstration team of the Provincial Grand Stewards Chapter of West Lancashire No 8516 to enact one of their pieces, ‘See who seeks admission.’ This basically entailed bringing the regular office bearers of the chapter into the room with a historical introduction for each, dressing them in their robes, then placing them in their positions within the chapter. The three principals, having been robed in the west, opened the chapter, then made their way east to receive the sceptres, following which a narration was given regarding the room and its settings. On completion the demonstration team assembled in the west and reported that they had concluded their presentation. Pictured from left to right, are: Malcolm Warren, Kevin Poynton, Barry Jameson, Sam Robinson and Mark Mathews. The first principal Joseph (Joe) Waldron, rose alongside his second and third principals, Bob Povall and Tom Grimes, to congratulate the demonstration team on their informative and enlightening presentation. He next welcomed the Second Provincial Grand Principal Barry Jameson and offered him the sceptre. Barry politely accepted, stood and addressed the chapter. 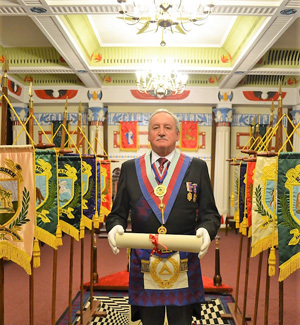 He pointed out that there were three elements to the evening, the presentation which had been so exquisitely delivered by the members of the demonstration team, the acknowledgement of the 150th anniversary of the Temple Chapter and to sadly surrender the warrant of Temple Chapter. Joe then welcomed Assistant to the Provincial Grand Principals Sam Robinson, Provincial Deputy Grand Director of Ceremonies Mark Barton and the Chairman of the Liverpool Group Mark Matthews. He also welcomed the other visitors, including the three principals from the Provincial Grand Stewards Chapter, Kevin Poynton, Geoffrey Cuthill and Eric Kos, accompanied by the steward of the chapter Malcolm Warren. He gave particular thanks to the first and second principals of Saint John of Jerusalem No 203, Mike Whitlock and David Ullathorne, along with David Crowley, who had each taken the role of one of the sojourners for the purpose of the evening. On completion of standard chapter business, Sam Robinson rose to give a summary of the 150 years of the Temple Chapter and some of the achievements of its companions over that time. The date of the charter was 4 November 1868, with the consecration being held on 26 January 1869, nine of the 21 founders also having being founders of the Temple Lodge No 1094 in 1866. Amongst the founders were three surgeons, an artist, an attorney and a wine merchant. 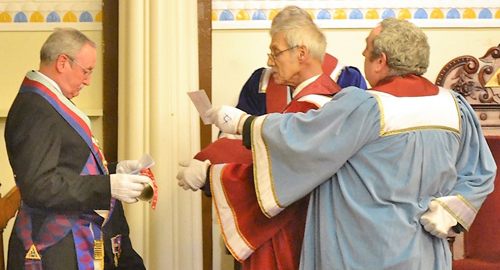 The ceremony of consecration was conducted by Provincial Grand Registrar Thomas Wylie and the original third principal was James Hamer, who founded the eponymous Benevolent Institution. The chapter met at Hope Street until 8 September 1968, but as a result of a major fire on 13 October that year, their November convocation was held at the Carlton Masonic Hall, Erbele Street. The chapter then moved to the Reece’s Masonic Suite, Clayton Square, for the next two years, which included the centenary convocation of 19 February 1969, attended by the Grand Superintendent, Sir Knowles Edge, Baronet. The chapter then found a home at the Prescot Masonic Hall, until returning to Hope Street in September 1970. Sam Robinson receives the charter from the three principals after closure. Many of the early records of the chapter were lost in the Hope Street fire, but it is known that in the years immediately before the start of WW1, eight brethren from James T Callow Lodge No 3596, and 12 from Liverpool Dramatic Lodge No 1609 were exalted into Temple Chapter. On 12 March 1920, seven out of 10 candidates were exalted at the same time! Although there is no concrete evidence, there is good reason to believe some ad hoc convocations took place during WW2. On 20 April 1994, the chapter celebrated 125 years in the presence of the Deputy Grand Superintendent Brian Jackson and the then Third Provincial Grand Principal Rev H.E. Ross (also chairman of the 6th Liverpool Group), led the companions in a prayer of thanks and the re-dedication of the chapter, to the honour of the ‘Most High’. Temple Chapter has had many members who have given countless years of service to the Province, including Gwillam Mills, J Banning and most recently Bob Povall, who all rose to become group chairmen, together with Stanley Sutch, Phillip Taylor and Steve Walls who were all group secretaries and vice-chairmen. Frank Forrester was a group secretary and W Jenkins was chairman of the hall committee. On Monday 18 October 2010, Temple Chapter was privileged to be selected as the host chapter for the visit to the Province of the Second Grand Principal George Pipon Francis. The chapter companions have also received many Provincial ranks over the years, with David Southward currently the Second Provincial Assistant Grand Sojourner and Howard Youdan and his son Mark, having been promoted last October to PPrDGSwdB and PPrGSoj respectively. Last to leave the chapter room is Sam Robinson, with the charter. Over time, Temple Chapter has welcomed joining companions from the Duke of Edinburgh Chapter in 2003, from the Prince of Wales Chapter in 2006, and from Queensway Chapter in 2008. Unfortunately. 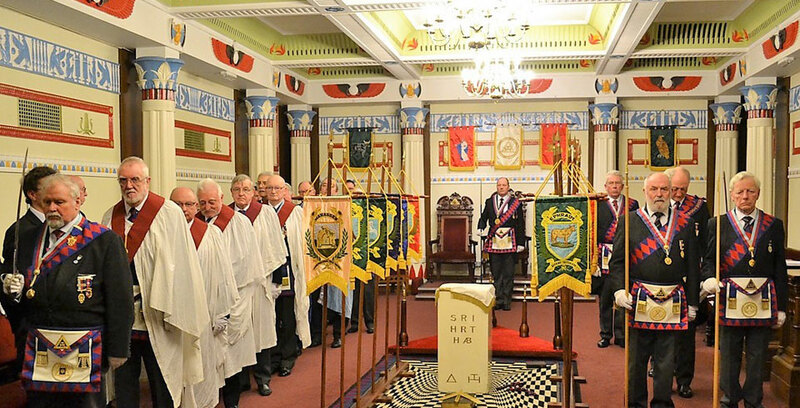 The chapter has struggled with retaining an effective membership, therefore it was decided to return the charter, with those who wish to continue in the Royal Arch and also at Liverpool Masonic Hall, being welcomed as joining companions of the Saint John of Jerusalem Chapter No 203. First principal Joe Waldron then thanked Sam for the rendition of the chapter history, which would of course continue in some form at No 203. Joe then announced the presentation of cheques for charity, consisting of £500.00 to the Christie Hospital, Manchester, £250.00 to the Tithebarn and £250.00 to the Blood Bikes. He then confirmed that the chapter accounts were up-to-date and audited and clearance certificates issued to all full subscribing members. A ballot was then taken regarding bestowing honorary membership of Temple Chapter on Anthony (Tony) Edward Johnson and Albert Coventry, which proved in the affirmative. Tony Johnson, being present, was congratulated on this most deserving recognition for all that he had done for and in the chapter over 40 years. He replied, thanking the companions for their consideration and expressing the pleasure he had obtained in being a Royal Arch Mason. The charities were honoured and raised £223.70, all of which would be donated to the Saint John of Jerusalem Chapter 203 charity account. The first principal of the Temple Chapter, Joseph Waldron, rose for the last ever time and asked the companions to assist him in closing the chapter. When completed, the companions stayed in their places as Mark Barton went to the Scribe Ezra’s table, where the chapter charter was now rolled and tied. He carried it to Joseph, who presented it in the approved manner to Sam Robinson, who likewise accepted it, before the Chairman of the Liverpool Group of Lodges and Chapters Mark Matthews delivered the valedictory address. Mark Barton then formed all the companions into two columns, grand and acting Provincial grand officers in the south, Provincial and other companions in the north and at 7.25pm, the final recession of Temple Chapter No 1094 took place, with all filing past Sam Robinson, who holding the charter, was the last to leave the room.